Cavities, cracks or flawed fillings that have been neglected can cause bacteria to reach the dental pulp – the part that is in the center of the tooth – and infect it. When this happens, the tooth can even become abscessed. A full examination and regular hygiene therapy sessions are efficient ways to avoid reaching this level of deterioration. 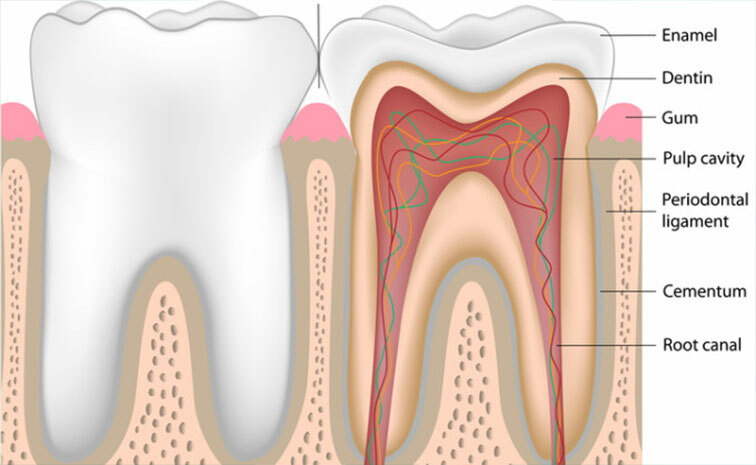 But when the infection of the pulp becomes irreversible, a root canal treatment allows the patient to keep its natural tooth, which helps prevent the surrounding teeth from drifting out of line. In simple terms, a root canal treatment is a procedure that seeks to devitalize the tooth while keeping it in place. To do this, the dentist removes the infected or dead pulp. Once this is done, the canal is cleaned and filled, and the tooth is completely restored so that it can look and function like a natural tooth. A root canal treatment generally calls for one or two appointments. The dentist first gives the patient a local anaesthetic. Once frozen, the tooth and surrounding tissues are ready for the actual procedure which consists of the creation of an opening in the tooth so that the pulp can be reached, removed and replaced using fine dental instruments. The tooth then has to be restored; a crown can sometimes be used if what is left of the natural tooth lacks strength.